Cette belle ferme en pierre indépendante est située au milieu de 3 hectares de jardins avec pelouse, qui comprennent un parterre de lavande et une magnifique piscine au sel alarmée de 11 mx 5 m. En 2018, nous avons eu un nouveau toit. Ceci est avec de nouvelles tuiles pour ressembler aux anciennes. Salle de bains 1. Formé d'un bain avec une pomme de douche à main, lavabo, toilettes et cabine de douche séparée. sol carrelé. Salle de bain 2. Formé d'un bain avec une pomme de douche à main et douche, lavabo et toilettes. Salle de bains 3. Formé d'un bain avec une pomme de douche à main et douche au-dessus de la tête, plus un lavabo et un WC séparé. En bas Vestiaire. WC et lavabo. Nous ne fournissons pas le linge pour le lit Voyage. Sur la terrasse à l'extérieur, nous avons remplacé la table et des chaises avec un métal et de verre surmonté table et métal mesh et fauteuils. Nous avons 2 teck steamer transats et 6 bois et le gâchis des chaises longues pour se détendre à la piscine ou sous les arbres ombragés dans le jardin. La porte d'entrée a été remplacé avec double vitrage et est peint en blanc. We had a fantastic staying. The house is gorgeous outside and inside, the garden and pool as well. The house has been renovated with taste and a lot of respect of the materials and local architecture. The area is very peaceful and green. The Périgord is an amazing area, a lot of places to visit. Well...it was perfect. We will definitely come back, one week was way to short. We are delighted you enjoyed all aspects of the house and garden and would certainly welcome you back another year. Thank you for your review. Fantastic stone property surrounded by rolling fields and woods in lovely rural location. The house is very spacious and finished to a high standard with everything you need - particularly in the kitchen. we had brilliant weather and were able to enjoy the area to the full, although leaving the pool was hard to do. We hope to return again. This was our second visit to Montelieu and we enjoyed it as much as the first. The rural location is idyllic, surrounded by farmland and nearby woods. The property is very well-maintained, well-equipped, and extremely comfortable. There are plenty of places for sitting out in the sun, or shade. The salt water pool is a joy to swim in. The local shops in Sainte-Alvere are very good. Thank you for such a good review we were delighted to have you back for a second time. What a lovely house. We stayed with our toddler and had a perfect week. The house is as described and well maintained. The owners had kindly supplied all we had asked for our toddler. Great pool and some very good recommendations for activities in the surrounding areas. I particularly appreciated the "library" in the evenings when children were asleep, sitting and reading with a glass of wine was a pleasure. Can't wait to come back next year. Thank you. Ps some notes in the house on local store opening times etc would be helpful! Thank you for your kind review. We will mention opening times of local shops in our house book. We look forward to receiving your family again in the near future. What a lovely holiday in a character period farmhouse. Well maintained by helpful and responsive owners. Our toddler loved the saltwater pool, which meant I could chill out by the pool and my husband and I loved the well equipped kitchen - we ate out several times at restaurants recommended but loved the local market and produce and opportunity to bbq. The house feels more like a home than a holiday rental and the owners mentioned they used it a lot along with their families. There were lots of thoughtful touches , especially in terms of supplies for our toddler. We will be back next year, thank you! 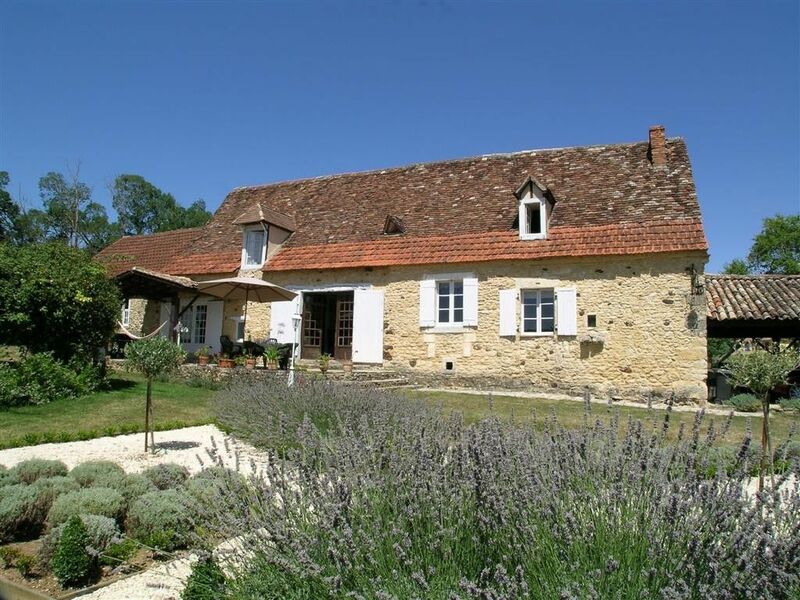 We stayed in this beautiful stone farmhouse last summer with our three children. The house was just what we wanted with a well equipped clean kitchen and a lovely salt pool. The house is surrounded by fields and woodland with plenty of walks. It is totally secluded but only 4kms from the village of Ste Alvere were there are most facilities . The owners were very helpful answering my pre booking questions. We all thoroughly enjoyed our stay. Autres Activités: canoë-kayak, kayak, tennis, marche, observation des oiseaux, Tir.